The Tyonek Tribal Conservation District (TTCD) is a non-regulatory, nonprofit 501c3 organization that addressees local issues through community-driven conservation. Our mission is to conserve, enhance, and encourage the wise use of the natural resources. 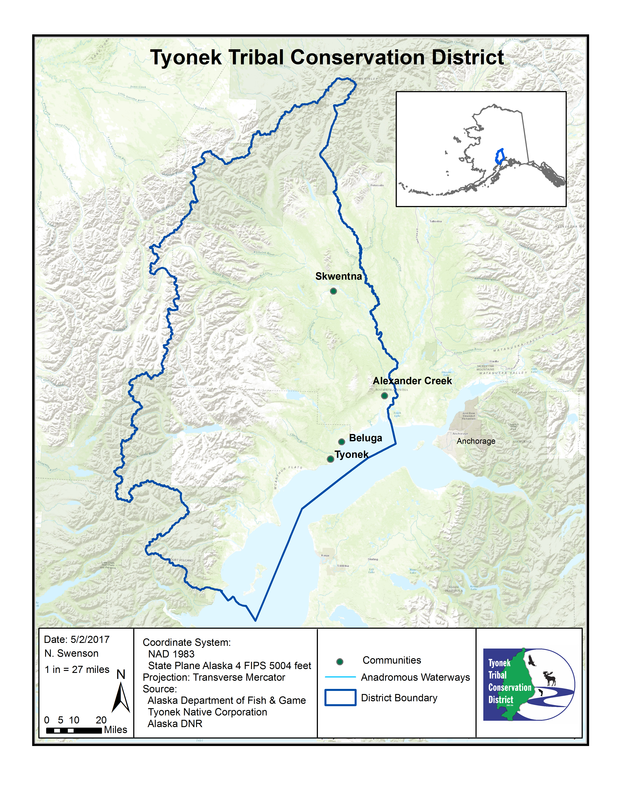 The District shares its boundaries with Game Management Unit 16B, and includes Tyonek, Beluga, Shirleyville, Alexander Creek, and Skwentna. The role of the TTCD is to provide technical and financial assistance to landowners and stakeholders within the District to help them achieve their conservation goals. Monitor and restore fish and wildlife habitat. Improve food security through community agriculture. Support sustainable practices through waste reduction and energy conservation. Provide conservation education and outreach. To learn more about TTCD’s conservation work, visit the Programs tab or contact us at (907) 646-3109.